This lightweight, quick-clamping portable highchair brings more to the table. Stylish, strong & safe. There’ll be no wriggling out of this one! The lobster gives you freedom from grubby cafe highchairs. Carry bag and crumb catching food tray included (dishwasher safe)! Unbelievably lightweight, flat-packing portability & quick-smart clip-on clamping to most tables. 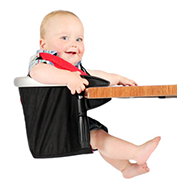 Smaller children often have trouble sitting securely in most regular sized highchairs. The 5-point safety harness with padded straps means even the smallest and wriggliest child will be secure. Safety certified for children 6 months to 3 years old with a max weight of 37lbs. Weighing in at only 3.9 lbs, the lobster weighs less than the baby and is easy to take everywhere! Seat flattens and handles turn inwards for the ultimate in space saving storage. Between use, keep it on a hook, underneath the breakfast bench, in a drawer, in your stroller gear tray or in the car trunk. Breakfast, lunch and dinner will wipe right off the easy wipe clean fabric, or simply slide the seat out of the frame and handwash. The comfy padded shoulder straps and 5-point safety harness prevent any kid from wiggling through! Padded waist and crotch strap ensures even small children cannot slip under the table. The wide food tray slides securely under the clamp grips, to protect the table surface and it’s dishwasher safe! Every lobster comes in a compact, custom-fitted carrybag so that it can travel anywhere you need it too. Hygienic alternative to grubby restaurant highchairs! Young ones will appreciate the familiarity of the lobster wherever they go, and parents will appreciate the easy clean fabric. Soft and durable fabric for ultimate comfort. Robust polyester fabric seat is easy to wipe clean and removable for machine washing. Lightweight – only 3.9lbs. Made with a strong aluminum steel frame. This sturdy, resilient frame will continue to look good, even with everyday use. Curved to contour a child’s body.